The Dominus Vitae Award is presented by Lutherans For Life to an individual for one or more specific achievements or for long-term, dedicated, life-affirming work. 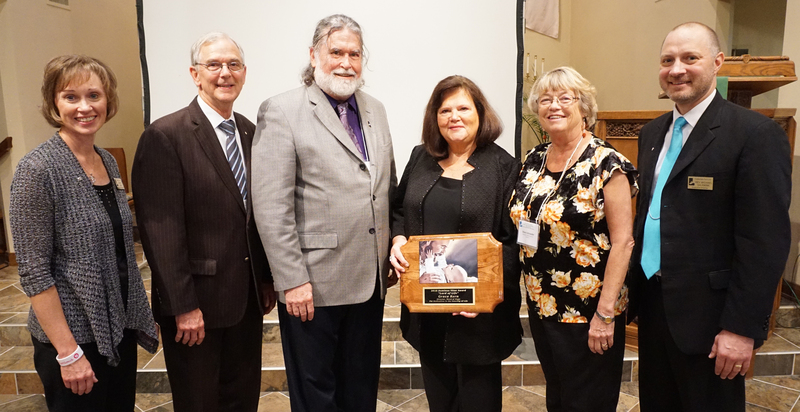 This year’s recipient at the 2018 Lutherans For Life National Conference was Grace Kern, former director of Word of Hope. Word of Hope (or Healing Hearts) started in 1991 with Grace as the executive director. She served without pay, often contributing her own funds for expenses. The vision for Word of Hope was to bring a Lutheran Law/Gospel perspective to post-abortion syndrome (PAS) ministry and to reach post-abortive women and men struggling with an abortion decision. Grace’s goal was always to show compassion and not condemnation, recognizing that Jesus died for all sin—even the sin of abortion. In her work prior to Word of Hope, Grace was involved with a crisis pregnancy center, seeing many Christian women who came in who had already chosen abortion and now were pregnant again. Word of Hope seemed the right place to reach out to give them a place where they could share their pain. Grace believes that she has spoken to about 25,000 women and men over the years, ranging in age from 13-93. They came from everywhere: churches, high schools, colleges, military, shelters, court services, jails, prisons, health departments, hospitals, YWCA, youth officers, and more. Grace took calls in the middle of the night, visited mental hospitals, went out late at night to visit with a woman because of a suicide attempt, and took people into her home. The calls came in from all over the world. She worked with the LCMS Chaplains who were dealing with the issue of PAS with female recruits. She trained deaconess candidates from Concordia, Chicago, to spread the message of Word of Hope across the nation through their various assignments and to assist women and men in their calls to various congregations. Countless babies were saved. Many babies were placed for adoption—too many to count. Another client, Frank, suffered from severe depression and found one of Word of Hope’s brochures in a Lutheran church. Through his work with Grace, he came to know Jesus and accepted forgiveness for the abortion decision he participated in 27 years earlier. Another young man, Daniel, because of his girlfriend’s abortion, drank too much in a bar and was involved in an auto accident that killed the daughter of a pastor. He served 10 years in prison, corresponding with Grace while incarcerated. Grace found Daniel a job with her husband’s business when he was released. He now works for the Social Security Administration and is married with two children. Grace also spoke to a young woman whose pastor had told her to get an abortion. According to Grace, this was one of the worst situations she has counseled. Whenever she received a referral, Grace always went out to help. Grace has always demonstrated her love of people and true compassion for those who are hurting. She is truly deserving of this award.